Maybe you get to the water late and find yourself working behind another angler—or anglers. 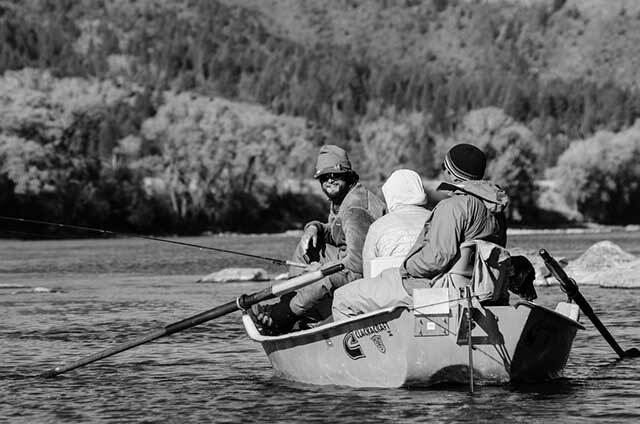 Or maybe winter temps bump up to above freezing for the first time in weeks, sending everyone to your favorite steelhead river and forcing you to fish above and behind other sets of boats. In those circumstances where there’s no place else to go, there are still things you can do to help minimize the effects of fishing in others’ wakes—and putting yourself back in a position of advantage. The streamer angler can also benefit from a modified game plan for those busy days on the water. At such times, finding the best fish can be less about “reading the river” conventionally and more about understanding the path that boats are likely to take through a given stretch of water—and where the fish in direct line of the traffic are likely to be pushed to. Fish will often be routed to low-tier holding lies that don’t have much to offer—save for respite from sloshing oars. These lies might not be a spot that would hold fish on a river empty of anglers. They may not align with your understanding of river hydraulics or even your sense of angling decorum. But on high-traffic days, they just might be where a big brown goes to get a little relief. Find them. Fish them. Let’s turn our attention to the small stream wading angler. Charlie Piette has spent the past decade guiding on the technical spring creeks of Southwestern Wisconsin. His first bit of advice is to identify the secondary holding water—the “B” spots. Fishing pressured water involves a new set of calibrations. There’s the water, and there’s the less-pressured water. Understanding your competition is also important. What is the average angler likely to be throwing this time of year? A size 8 Chernobyl? If so, try something smaller and more subtle—a size 12 Letort hopper. More than anything, you’ll need a different mindset. You’ll need to step to the back of the batters box, dig your cleats in deep, and really work the count. Work patiently and with confidence, and you just might turn an overly busy day into an overly fishy one.